This week saw the second instalment of the City Beats project, a music program from students from schools with high levels of ESL and financial disadvantage. I’ve been working with four different groups of students aged 8 to 12, from four different schools. In their first visit, they wrote a short, three-part story and composed music to depict those stories, organised into three sections (you can read about that first set of projects here). This week’s visit was their second to the City Beats project, and the focus was now on building up their compositions for percussion instruments, section by section, into whole-ensemble pieces, with strong structural coherence and a student-composed part for each child. It was an intense and noisy couple of days! I realised at the end of the first day that we were asking them to do something far more challenging than we had the first time round. No more break-out groups. Fewer opportunities for lots of individual attention. Instead, the focus was on arranging, and working together as a large ensemble of players, learning your part, only playing when you need to, and so on. Sure, there was still room for surprises and further creative additions to the music, and some new ideas and developments definitely came forward. But mostly, this second workshop was about being part of a group, and playing your part. Some of the groups found this pretty challenging. This is an exciting project for them, and they come in ready to PLAY! The process sounded confusing to them when I first explained it, I suspect. They needed to experience just how we would put the pieces together in order to understand the process. And the process works. By the end of each session, we had completed a five-minute arrangement of one of their compositions, some with quite complex structures and section transitions, in which everyone had an instrument and a part to play. It was particularly satisfying seeing the students start to ‘get it’. One grade 5 boy caught my attention in the final workshop of the two days. He hadn’t seemed that engaged, and, along with his group of friends, had to be reminded to stay on task. However, by the end of the workshop, as we started to put all the layers of music together, his demeanour completely changed. Suddenly, he could make sense of what we were planning to do with all this music, all these riffs. He understood how it all fitted together now. From then on, he was the first to respond when I raised my hand for quiet. He gestured sternly to people in his section when they started playing their part at the wrong time. He kept his eyes glued to me – absolutely glued. A transformation of understanding and meaning had taken place for him in the two hours we worked together. There were others like him, in each group. And at the end of their two hours, despite having worked incredibly hard, and with considerable focus required of them, the buzz from the groups was that they didn’t want to leave! I imagine that, when we see them again in Term 3, ready to arrange another section of music from their Term 1 compositions, they will have a much clearer understanding of the creative and collaborative process that we’re using. A couple of weeks ago now – the day I returned from my week of leave in Byron Bay and Brisbane, actually – I heard Professor Jonathan Neelands (Warwick University) speak at the University of Melbourne on Acting together: ensemble as a democratic process in art and life. Who wouldn’t be immediately intrigued by a concept like that? Such a sublime marrying of political theory and art-making. As ever, I love finding parallels between art-making and other, more established, articulated agreed-upon theories, disciplines and methodologies. Regular readers will note how very behind I am in my blogging (due to a couple of pretty busy weeks), so forgive me if I just add some (potentially disconnected) notes here on this most interesting presentation – copied into this post pretty much word for word from the notebook I had with me on the night, into which I was frantically scratching away with my pen, throughout the talk. Drama… ensemble… activism (as in, being active, as much as anything else). Process is more important than outcome. The struggle, rather than the end result. This, Prof. Neelands stated, is true in activism as well as in art. A sense perhaps of subjugating yourself to the greater good. Hmmm… in principal I like this value, however, I don’t think it is so easily summed up. At the end of the talk I raised the question about orchestras, where everything that happens in arguably for the greater good, but leaves individual players stifled, frustrated, without any genuine creative outlet or sense of one’s own contribution. Prof. Neelands countered this by saying that it is not ‘the greater good’, but the absence of any true democracy, that causes this numbing of the spirit in orchestras. In drama, individuals are asked to put the ‘common good’ ahead of their own private interests. Neelands was open and unapologetic that, in all that he discussed, there was strong idealism. Idealism, and proceses that depend on idealism, he said, are probably not realistic in society. But in a classroom, or in an ensemble, it is (or should be) realistic. I liked this statement too. I have long hated the argument often raised again perceived injustices or inconsistencies (or double standards, or unnecessary/avoidable harshness), in schools, of “Well, that’s life.” No, I counter. It isn’t life. It is school. There is plenty of time for life (and all its attendant cruelties and injustices and harshness) when these students have left school. But when else in their lives might they discover who they could be in an environment designed to support them and bring out their best? Since when did we need to toughen people up, exactly? Resilience isn’t learned by facing life’s toughest battles as soon as possible. Resilience is far more likely to prosper and grow in a loving, encouraging, positive environment. Right. Off my soapbox, back to Dr Neelands. [It is] a chance to create a better version of the real world on an achievable scale that celebrates the virtues of collaboration. Democracy is an unfinishable process, it’s constantly re-defining itself… you can’t just claim something as democratic and then assume it is, and will remain ever-thus. You have to keep working at it, checking it, supporting it, not taking it for granted. We live in societies that discourage active participation, that encourage passivity. Do direct, participatory forms of theatre lead to direct, participatory forms of living? ie. democratic principals of living in society? Rather, Prof. Neelands pointed out, we tend to have ‘representative’ versions of democracy, and therefore also of theatre – people who act on our behalf, as our representatives. What are the reasons people – young people, but also people of any age – may be reluctant to participate actively in a class or in an ensemble? Fear of ridicule, being looked at or the subject of uncomfortable attention, of being judged, of wanting a quiet life, of a reluctance to lead or demonstrate an opinion…. these are parallel with the reasons for why people don’t actively engage in their communities. Drama teachers teach as if their students have a choice of whether to be there or not. Imagine if every teacher, or every subject, taught like this! Today I have been writing research memos. I am trying to get a bit of clarity on my research methodology, and on the early emerging themes that are swimming around in my head, before I have made any proper analysis efforts. First, an admission – I am doing all this in the wrong order. I should have had my research methodology well and truly decided at the time of putting the ethics application in. And I did have it decided, but since then, the more I read, the more I have been feeling that what I have proposed is not quite right. My research project doesn’t seem to neatly fit in one methodology. A second admission – I’d like to use a bit of a pick’n’mix approach. A bit of this for the data collection, a bit of that for the analysis, yet another approach for interpreting… I suspect this is unorthdox at best, messy and potentially incoherent at worst. You see, to me, research projects feel like arts projects. Someone said to me on the weekend, as I described my project, that he didn’t envy me… to have to ensure an objective position on all this data that I am so close to and so entwined with… but this feels natural and ideal to me. In a devised project – whether it be theatre (like Hunger last year) or music, or another discipline – one of the most important things is to let the show reveal itself to you. You keep asking questions – setting up possibilities that feel like that might reveal something new or exciting or unexpected, or beautiful – and remain open to the outcomes. Gradually the links and connections, and the natural narrative that is the result of this combination of people and events, at this particular time, will emerge. I feel very at home with this kind of approach to work, and have developed an instinctive style. This instinct keeps kicking in in my research project, and I don’t know how much to pay attention to it. Maybe it is sloppy and immature of me. The methodology books I read (on case study, grounded theory, and phenomenology, mainly) give me little thrills as they spell out the necessary steps to ensure good research practice. I like the idea of following something to the letter. But at the same time, my instincts also keep jumping in, with their own take on how I should respond to the data I have collected. Firstly, there will be the students’ perceptions of the music program – what sense they make of it, what they feel takes place, and what they feel they learn. Then, this will move into a broader discussion of the experience of ‘transition’ and the impact this has on students of this age, in how they communicate, use language, respond and perceive their new surroundings. In particular, I wonder how appropriate this research question is for students of this age, when they are in the midst of such a confusing time, trying to make sense of so many new things. Thirdly, I think this will lead to a discussion on research methods appropriate to this age group, when ina time of transition. How do you elicit responses from someone when any perceptions they have are infused with the newness and unfamiliarity of their situation? How much can they articulate (in any language) at this stage? What effect does learning a new language at school have on their first language, in terms of effective communication? What kinds of research approaches are effective in this kind of environment? I think I will probably present each of the students as individual case studies, then look for convergent themes between them. “Who wants a suspended cymbal?” asks percussionist J, ready to hand a cymbal on a stand over to one of the group. “I’d rather have a suspended sentence,” was the bone-dry, rapid-fire response from one guy, and we all roared with laughter. The Orchestra’s project in the prison started today. Me and three musicians from the orchestra, along with our fantastic sound designer D, and the music teacher from the prison S, had our first music workshop with nine guys from the prison. It’s a project idea that I have been nurturing and progressing at the Orchestra for several years now – so this day is particularly satisfying. How would the prisoners respond, and what would they be into? How structured could the session be? Would we be able to move away from simply jamming on songs they knew, towards freer, possibly more esoteric, improvisations and pieces? Would the microphones distract or inhibit people’s responses? This is a complex project, and its many elements came into being as a response to the characteristics of the environment. We are in a transitional prison, so we wanted to make sure that everyone who took part – even if they would only be around for one session – could somehow contribute to the final piece; we wouldn’t be able to do a final performance, not even in the prison, as many of our participants might not still be there by that date, therefore we needed a project design that didn’t lead to a performance outcome. To get around all of these issues we have a sound designer involved. I’ve worked with David on different projects since 2000 – he is an amazing collaborator, very generous, very open to experiments, completely skilled and expert in his craft, and wonderful at translating the esoteric wordy descriptions of classical musicians looking for a particular sound into… exactly the sound they are looking for. David comes to every session. He is recording all the conversations, all the improvisations, catching sound bites wherever he hears them, able to process in an instant a grab of sound, to make a cool rhythmic loop over which more improvisations can happen. After the workshops in the prison are finished (and the workshops with families – we have two workshops for parents and/or children of people in prison) the musician team will gather together for a further three sessions, in which we will devise a performance piece, or suite of pieces, using the material from all the workshop sessions, and record it. The CD of this recording will then be sent out to all of the participants, wherever they are. That will be in May. It is a very busy time just now. Ethics application went in today but the list of big things I need to write is… big. It makes me aware of how much brain space I normally like to use for teaching. Teaching for me is very creative. I develop a composition project for each of my three classes and these progress from week to week. Each week I go in with a plan that builds on whatever was created the week before; at the end of the day I make notes and transcribe all the music we came up with, and sometime before the next class I fashion these ideas into a possible shape for us to try. It is a very responsiv and open process. However, it takes brain space, and today I feel very very aware of how little I have left! Administrative tasks do this to me – there are usually deadlines and tangibles and ‘deliverables’ with admin, that make the tasks have priority, somehow. Also, it is hard to go into creative inventive head space when there are tangible administrative things hanging around, nagging at you to get done. I am doing an extra day at the Language School this week, so I have less time between lesson days to plan and let the latest ideas roll around in my head and get worked on by my subconscious. I go there again tomorrow and while I have a plan of what I will do with each class, and where each project is up to, I can feel a kind of heaviness in my head that makes me look forward to having a day with no deliverables or big tasks attached to it. 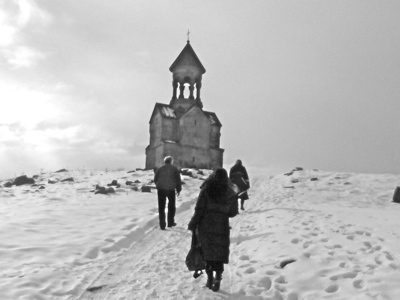 This is a hill-top church in a small town called Kaputan, a short drive from Yerevan, Armenia. We visited here on our first day. There was no snow in Yerevan on this day- it was grey and foggy, and all the surrounding mountains were obscured by thick smog. Kaputan, by contrast, sparkled, and the sunlight danced off the snow. Overall, since I have been in Paris, the weather has been very mild. However, the day that C came to visit it rained and rained and rained. So I thought I would share with you this rather pathetic shot of the Eiffel Tower in which the umbrella was blown into the frame. I like the contrast of colours. But since that day it really has been quite pleasant, with some sunny days perfect for wandering in the Jardin Des Plantes. Last night CP and LP included me in an invitation to dinner at their friends’ apartment – a charming, artistic older couple who live near the Arc du Triomphe, and who made me very, very welcome. CP made a tart, which caused him to be running a little late. (He said, “But I’m coming with a tart, so they will wait.” I let him know in no uncertain terms that that wasn’t a very nice thing to call me.) The tart was more of a pie, and very tasty indeed. I should have photographed it as it looked magnificent. Spinach, ricotta,and mushrooms, with ronds of goats cheese on top. Together we watched the video of Colin, the Armenians, and I performing the Khatchaturian Trio in Ohrid, Macedonia, for the opening of the Council of Europe’s newest Democracy Embassy in 1997. (This is the music we will revise for the concert in Yerevan). Dominic and Irene (the couple) were a wonderfully appreciative audience, and recognised the magic of the ensemble that we created at that time, with that piece. I don’t mean to flatter myself, or act too proud, but I know – all of us knew – that we had created something very special together when we worked on the Trio. 1 professional violinist who will be assisting me (Mel, who works with me at the Language School). A section based on the ‘Walking, standing, sitting’ score that I used in September and with the AYO people, using set pitches. Something that involves chance or random processes on the day, that might involve the newspapers or mobile phones I have asked participants to bring with them. I might use the idea of unpacking and packing up of instruments ( also used in September, that worked beautifully). I could ask each of the adults to set their alarms to ring at key intervals; each time one rings, the next section of music starts. The newspapers could be read aloud, starting very quietly, then getting louder. This could happen with the whole ensemble, away from instruments. Perhaps the rule could be that they must be newspapers from that day. Notebooks being written in could be a cue for a solo during the ‘Walking, Standing’ score. We could have a chorus of mobile phone rings. The newspapers being read, or held in different ways, could be what the musicians respond to in the “Walking, standing” score – for example, turning a page means a change of pitch. Standing up to read is a different pitch or musical gesture, as is folding the newspaper and tapping it into your hand. I’ll add to this during the week. I don’t expect I’ll finalise the plan until Thursday or maybe even Friday morning. A main concern will be the use of time on the day – I don’t want to exhaust the group, but I do want us to create something that could last for 15 minutes. When we perform in the space there won’t be any other groups close by us, which is good – we’ll have a lot of sound-space to work within. And today we had our dress rehearsal. We started the day by going through a couple of scenes where there were some new lighting cues to be noted, then we started our run. Like yesterday, but even more so, the who has a strong shape and momentum now. It feels like lots of the hesitancy and slowness of yesterday’s scene transitions has gone, replaced by swiftness and no slackening of tempo. The cast is growing in confidence. “I feel like we are in a good place now,” the director told me happily, as we walked to the production meeting at the end of rehearsal. Today we also made up, which also helps people to get in character and respond authentically to others’ characters in the space. Cupid had wings added to his costume today, and he is delighted! We are still having difficulty with one of our pieces. Ensemble-wise, it can easily feel shaky – a bit of a house of cards. It is driven very much by the cello, but our cellist is playing from a balcony behind us at that point in the show. We have great foldback, but somehow it is still tricky to keep together. Also, most of our cues for section changes in the piece come from the stage action, so when we practise out of context we have to contrive the timings of these changes ourselves. We finished our rehearsal today working on it again, finding musical solutions to the main issues, and happily resolving our concerns somewhat. Our next chance to run it will be in Monday’s dress rehearsal, which is open to a small audience. Hunger has been such a rich experience for me. There are so many aspects of the show and the production that have been new for me, and indeed, I am usually only one step (or half-step) ahead of the musicians at any one time – and it has been that way through the whole year! I often encourage the MSO musicians to feel brave about stepping out of comfort zones, reminding them of the great and exciting things that can happen when take risks, and have to trust our instincts and responses. In most of my MSO projects I am working in a context that is familiar for me, and while I deliberately set about challenging myself in all of the projects, I am still somewhat in a comfort zone. In Hunger I am constantly having to put myself out there, be courageous, trust my instincts, watch and learn and absorb all the information that I can. It is a very, very good thing for me. Tomorrow (Sunday) is a day of rest. Much anticipated, and much needed by the whole ensemble, I think. Come Monday, we will be refreshed and geared up, ,reading to share our beautiful heart-felt, heart-filled work with a wide audience. Hunger is in the homestretch now. Today we had our Tech Run. There have been a few unforeseen delays leading up to today (when I arrived I got the impression something a bit unexpected/alarming had been narrowly averted the night before… it may have been narrowly done so, but averted nonetheless!) But what is amazing is the number of things that need to be in place – the many technical requirements, people, final designs for lights and sound, the gear in place for these, staging assistants, and their assistants… for a show of this size, with this many performers, and complex staging. One delay, in one area, can place all sorts of pressure on other aspects of the show. Similarly, the content of Hunger is also filled with intricate connections. The run-through today was somewhat clunky – as you would expect, given it was our first Tech Run and there was a lot to adjust to. But also exciting, because with sound, lights and costumes all in, we are getting a strong sense of the show, and of the beautiful material that we have created. 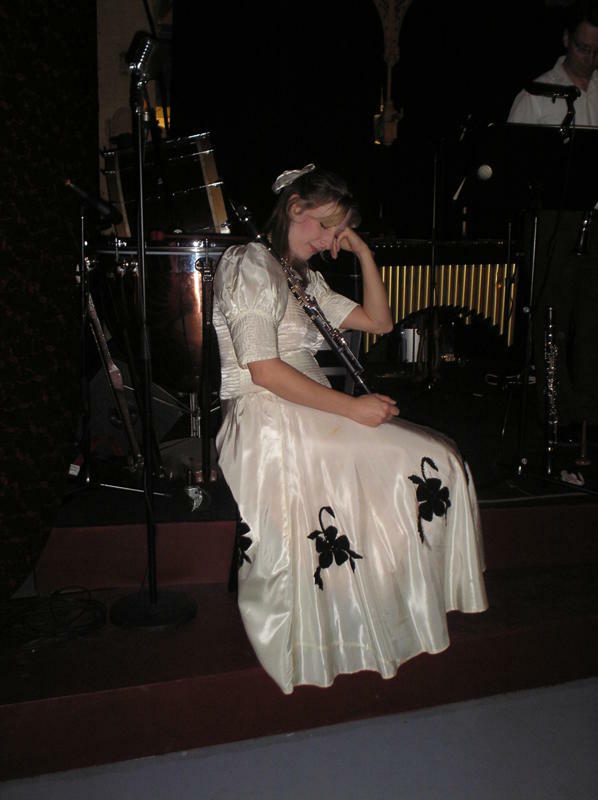 Gillian’s stage position at the start of the show – it begins with the musicians asleep, slowly woken up by a dancer. I have a gorgeous dress to wear. I can’t help but swish my way through the space, in my long circular skirt, with its black flower motif and rustling taffeta. The fabric is frail and threatens to give way, as this dress is an original from the 1930s (they tell me), with a pin-tucked bodice, black velvet buttons, and leg-o-mutton sleeves to my elbows. I drape the skirt about me as I sit on the side of the musicians’ stage, and ensure it falls elegantly to the floor when I sit on the piano stool. I feel like a girl in her first ballet frock. I’m a dag, I know. It’s an exciting process to be part of – kind of thrilling and terrifying at the same time. At this stage I realise I am starting to feel nerves set in. Will my hands shake? That is the one thing I feel I can’t control so easily. And if they shake, will I make mistakes in my piano part, or my vibraphone part? These are the instruments I feel less secure in. The musicians from MSO seem happy with the work, and proud of the show. Costumes, make-up and lights are all pretty special for orchestral musicians, who usually keep themselves more in the background in order to bring the music they play to the fore. I think that like me, they are particularly enjoying seeing the show come to life, from its typewritten structure, set out under headings, with short descriptions of the action that takes place. As it comes to life, it starts to flow, and build a momentum of its own. Tomorrow we have our first dress rehearsal. A small group of supportive people will come to our final dress rehearsal on Monday. After that, we open our season! After the Note To Self performance on Saturday night a friend and I started pondering the different kinds of workshops and workshop processes that are out there. There is a spectrum I think, that stretches from quite directed/directive processes, where there is little scope for being changed or swayed by content that comes from the participants, to very open, responsive processes. My projects are closer to the latter, with an emphasis on material being generated through content ideas offered by participants. I will often have musical structures in mind, or place restrictions on their offers (such as modes or pitch groups or time signatures, or specific ways to start or finish), and I may even have some pre-written sections that need to be learned; but there will still be large sections of the work that are unknown at the start of the project, to be realised through the creative process. Directed processes have their merits – they offer very tangible experiences to the participants and can give a sense of being part of something ‘official’ or endorsed, somehow. In music, it can be a sense of having learned ‘real’ music, as oposed to just ‘making stuff up’. From an audience point of view (especially for an uncritical, non-educator audience) it can seem like the directed process is the more successful of the two approaches, as the results are often more ‘adult’ in their delivery, with less open to chance or possibility. Process can be a difficult thing to take into account, or credit (for the uninitiated), if you are only exposed to the outcome of a project. Today I worked with the Sartory String Quartet, the Australian Youth Orchestra’s string quartet that will be resident in Albury at the Murray Conservatorium for the next 8 weeks or so. We will be doing two separate education projects with local primary school children as part of their residency, so today’s session was an introduction to the way I work in this context, and to get them thinking about what the children will get out of the project, and what they themselves would like to get out of the project.